We can even install exotic animal skins on your ride. We'll replace the fabric on your chairs, ottomans and loveseats. We'll change the color of your seat covers and fill the seats with new foam. 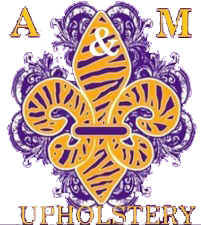 Call A & M Upholstery at 337-493-2091 today to schedule a consultation for any of our upholstery services. The owners of A & M Upholstery don't just act like family, they are family - they're sisters, in fact! When you choose us for any of our upholstery work, you can expect us to treat you like one of our own. We'll sit down with you to learn about your vision for the project and then talk materials. You won't find anyone who cares about your project as much as we do. Copyright © 2019 A & M Upholstery, all rights reserved.